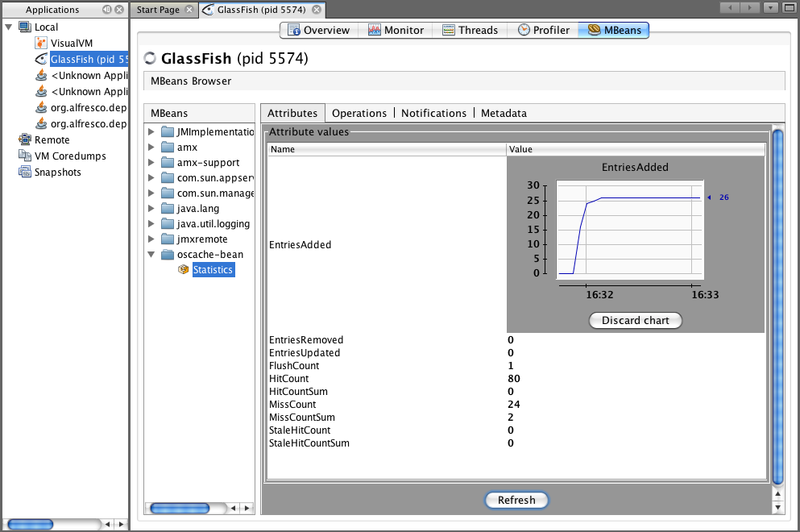 Given an existing web application that uses OSCache, we can pretty easily add support for JMX monitoring. As for Spring support, we are restricting its introduction to a small aspect of the application (for now! ), so we are minimizing the impact on the rest of the application. Firstly, we need to set a listener for OSCache that will publish the statistics we are interested in. If you’re using maven, add a dependency on spring-web. This has dependancies on spring-core, spring-context and spring-beans (At the time of writing, 3.0.2.RELEASE was the latest version in the maven repositories). Otherwise download these manually and chuck them in your WEB-INF/lib. The map in the exporter links the statistics bean to a key that will be visible in JConsole. Note: The OpenSymphony link in the references below gives you code to expose an arbitrary JMX connector and port. This is unnecessary since we’re accessing via the application server. The web.xml then needs to be updated to be told to load the new cacheContext.xml. JDK 1.5 includes two JMX clients that you can use. jconsole is the legacy monitoring application, which has been superseded by the fancy UI of jvisualvm. Either application will allow you to monitor the statistics bean, however in jvisualvm you will need to install the plugin VisualVM-MBeans under Tools > Plugins. Meanwhile jconsole has an MBeans tab by default. When your application is running, use one of these utilities to connect to the application server (either directly or via localhost:8686 for glassfish). Under the oscache-bean > Statistics, you should be able to see counts generated by cache attributes. Double-clicking the numbers will pop up a graph, and right-clicking will allow you to export the recorded values.